A traditional rivalry between two local powerhouses in athletics is set to flare up again when the Guyana Police Force meets the Guyana Defence Force at the 2011 Joint Services Athletics Championships scheduled to start tomorrow. The week-long meet will commence tomorrow with a road relay event that will start at the Police Sports Club ground while the track events will get underway from Monday at the Camp Ayanganna ground. With the two robust teams set to do battle the calibre of competition is expected to be generated by elite performances. The match-up between silver medalist at the 2011 Alliance for the People of Our America (ALBA) Games, Winston George of the Guyana Police Force (GPF) and Senior National Champion from the Guyana Defence Force (GDF) Rupert Perry has all the elements of a classic. 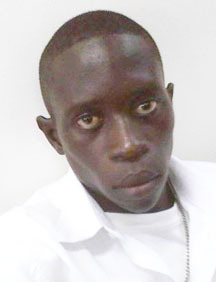 Perry, who is a 100 and 200 metres sprinter, convincingly claimed the 200 metres title at the Joint Services event last year and has risen to become Guyana’s top sprinter this year. 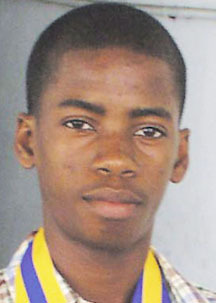 However, while George can be deemed as Guyana’s most versatile sprinter since he competes in the 100, 200 and 400 metres events, he has proven himself a dominant force in the 200 metres and 400 metres this year by running a sub 46s 400 metres at the ALBA Games. 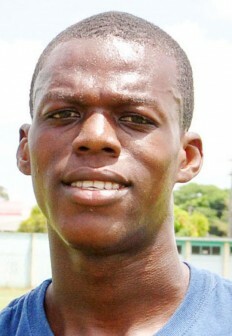 The 400 metres time gained him the distinction of being the fastest in that event among Guyanese who trains on homeland turf. George also gained a victory over Perry two weeks ago at the Police Sports invitational race while Perry came back with one over George last week with a victory at the Police Gymkhana event which has definitely set up a final showdown between the two talented sprinters. 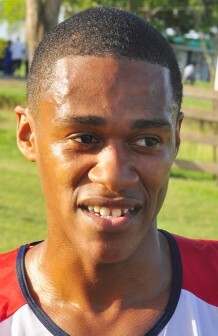 Speaking with Stabroek Sport via telephone yesterday, Perry was quick to point out that he has total confidence in his abilities to be successful come race day. “Well I’m feeling really confident and positive heading into my races. I’m not looking only to win but to leave the spectators amazed and shocked by my timings. I want to blast under 10s in the 100 metres but I’ll leave the 200 metres timings until the race is done…but I know it’s going to be something in the low 20’s,” Perry declared. Perry also gave some insight as to why he will come out victorious over George at the Joint Services event: “He is a great athlete and I will not leave him out of the race but I’m faster than him so I know I have the edge,” Perry commented. However, George in a telephone interview with Stabroek Sport confirmed that he will be a part of all three sprint events at the Joint Services Sports and declared that his main aim is to win his events. “My expectation is to be successful in all three of my events. I don’t have any specific time I’m looking to run, my aim is just to go out and win,” George stated. In reply to Perry’s prediction of running a fast time in the 200 metres, George stated, “Well if he is looking to run low 20’s then I will be doing the same but best of luck to him because it’s going to be stiff competition. “The technique that I defeated him with two weeks ago is the same technique he used to beat me at Gymkhana so I’m just going out to do my thing,” George told Stabroek Sport. Seasoned campaigner for GPF Dennis Horatio, who won a $100,000 800 metres race over distance king from GDF Cleveland Forde at the President/Jefford track classic earlier in the year, declared that Forde will have to work hard for any victory he wants to get at the week- long event. “Well so far I didn’t put in as much work as I should have for the event, but I’m going out there confident and to compete meaningfully so I could win. “For me I know it will not be easy competing against Cleveland but it will not be easy for either of us as well…he won’t get any easy wins, I’m not saying that he will win but he got to run hard to win,” Horatio stated. Meanwhile as the GPF has dominated the competition in the female sprints and field events, the GDF with some new additions to their squad from last year seems set to put up a fierce fight in those two areas.